Want an EASY Easter Egg Hunt? Easter Egg Hunts are such a fun part of being an elementary teacher! What’s even better? A fun, EDUCATIONAL, and EASY Easter Egg Hunt! I created two different Easter Egg Hunts to help you have some fun with your students. For both Egg Hunts, you will need plastic Easter Eggs. It’s totally up t o you how many colors you want, but you should have different colors for each group. So, if you want 6 groups, you will need 6 different colored eggs. You will need at least 6of the same color eggs. 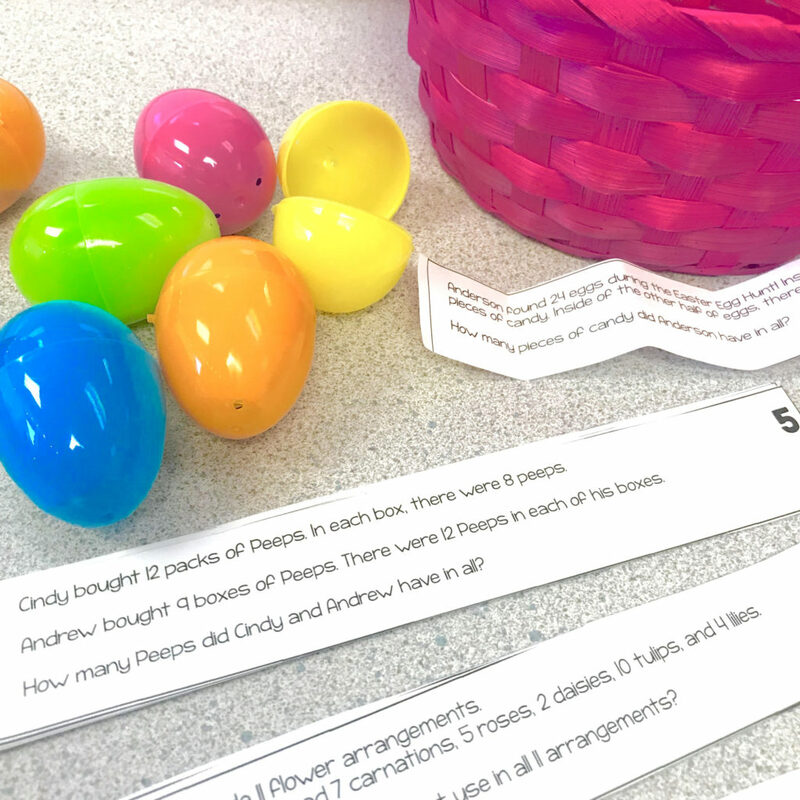 For the first Easter Egg Hunt, you will have students solving multi-step word problems. Place the word problems inside of the Easter Eggs and hide them in your classroom. You will group students and place them into color groups. The groups will find their eggs and begin solving the problems. Students will record their answers and once they finish with all of their problems, they will receive a prize if they get them all correct. Later on in the day, I am going to have ANOTHER Easter Egg Hunt. This one is ELA based and includes anagrams. The same color scheme can be used as the first egg hunt. During this hunt, you will place letters inside of the eggs. 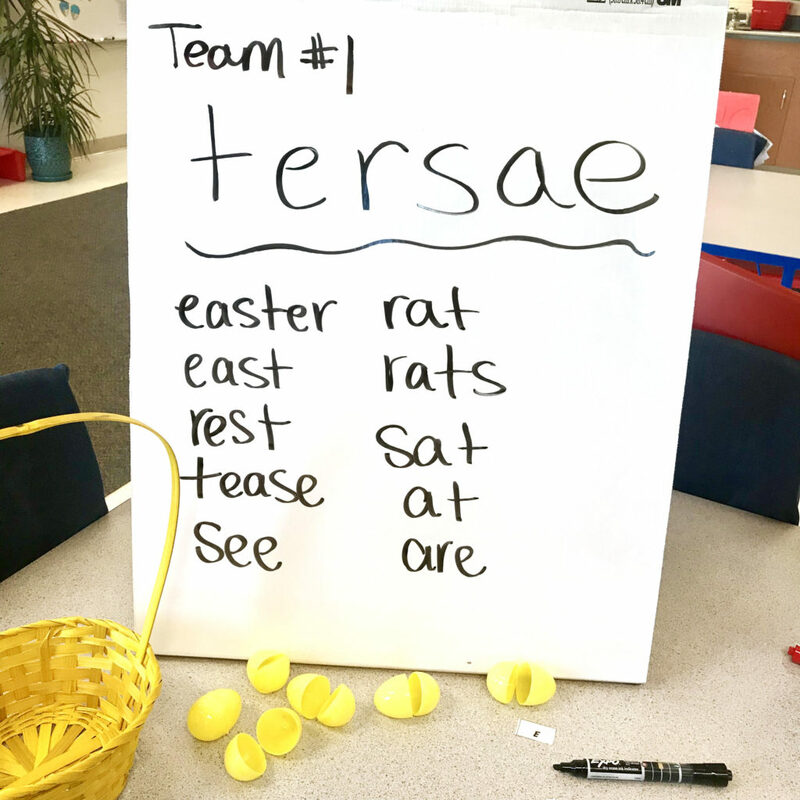 For example, in one set of eggs, you will place the letters E-A-S-T-E-R. You can give students a large piece of poster paper. After they go find their eggs, the group will place their letters across the top of their poster. They will then work as a team to make as many words as they can using the letters they found in their hunt. After a period of time, students will be stopped and points will be counted up. Students receive 1 point for every letter from each word they created. Again, students will receive a prize for the high score. Check out the Egg Hunts here! I hope this helps make your spring just a little more fun and helps you with planning before spring break! Enjoy the EASY Easter Egg Hunt!